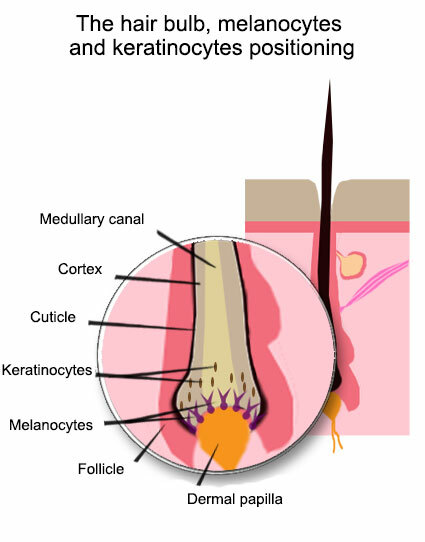 Hair grows out of follicles located in the junction between the deep layers of the dermis and the hypodermis. These follicles are also known as hair bulbs. Blood flow is supplied by a small vessel that passes through the inside of the hair shaft, thus providing the hair with all the vital elements it needs to remain healthy such as amino acids, mineral salts or vitamins. The hair shaft is surrounded by glands, the most important being the sebaceous gland, which produces sebum that acts as a natural lubricant for the hair. 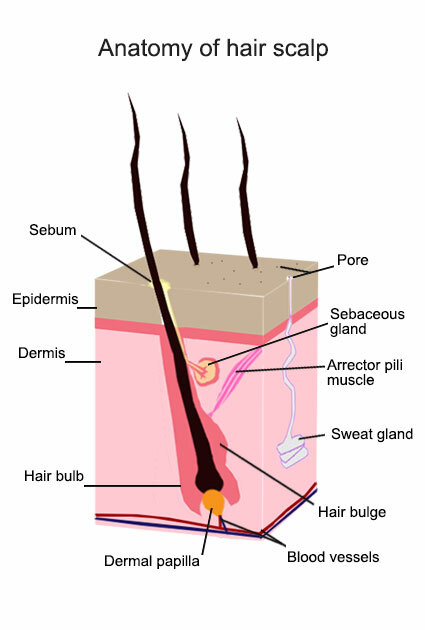 On the surface of the scalp, pores evacuate the sweat produced by the sweat glands. The hair is made up of 95% keratin, a fibrous, helicoidal protein (shaped like a helix) that forms part of the skin and all its appendages (body hair, nails, etc.). Keratin is synthesized by keratinocytes and is insoluble in water, thus ensuring impermeability and protection for the hair. Some 18 amino acids can be found in the hair, such as proline, threonine, leucine and arginine. 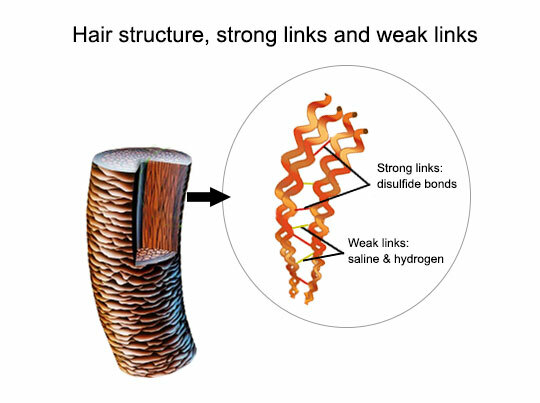 Keratin is particularly rich in cysteine (a type of sulfurated amino acid), which forms disulfide bonds between molecules, adding rigidity and resistance to the entire structure. shaped like scales that are layered one over the other, measuring about 60 micrometers long and about 6 micrometers wide. 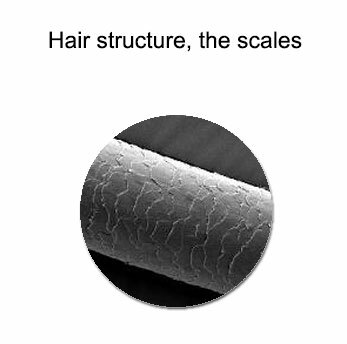 the hair length: these are macrofibrils which are made up of microfibrils, which in turn contain protofibrils. The hair cortex also contains melanin. Made by specialised cells named melanocytes, melanin is the pigment responsible for the hair color. 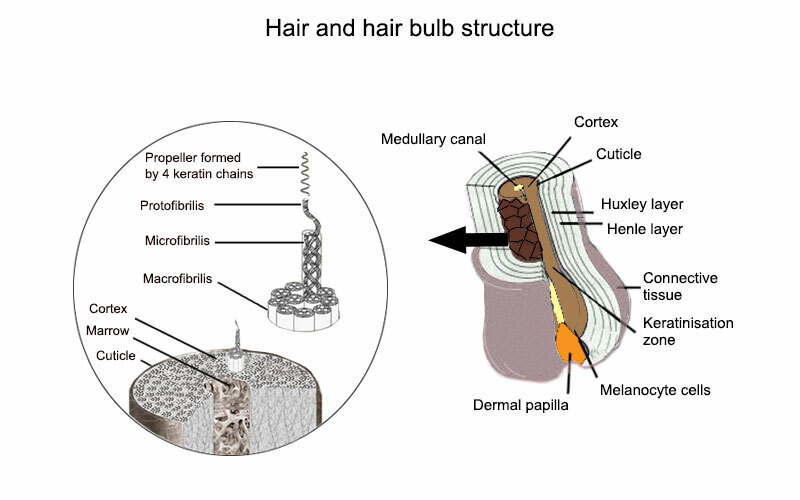 Situated near the hair bulb the melanocytes inject pigments into keratinocytes of the new hair shaft. The color lasts during the hair cycle, from the genesis to the end, when the hair falls.